Charles Rollo Peters, called “The Poet of Night”, is best known for his Tonalist landscapes, especially nocturnes, with much of his subject matter being scenes around his home in Monterey, California. James McNeill Whistler, who promoted the Tonalist aesthetic in Europe, was a major influence on his painting and “is reported to have said that Peters was the only artist other than himself who could paint nocturnes.” (Gerdts) As Peters matured, his life became increasingly tumultuous, but the one stable part of his existence was his painting. He continued to pour his emotions into his work, creating lonely, mysterious nocturnes with a palette of deep blues and blacks. The scenes were invariably dotted with a speck of light emanating from the moon or a lighted window. His landscapes usually displayed a more prominent sky view and often included a winding path or road trailing off in the distance. Peters was born in San Francisco, California in 1862 to a wealthy family, and attended Bates Private School for Boys in San Francisco and the City College of San Francisco, where his talent for sketching and painting became obvious and was encouraged. After graduation from the College, he spent time as a commercial artist, but this pursuit did not hold his interest. In the mid 1880s, he began to study privately with Jules Tavernier and also attended classes with Virgil Williams and Christian Jorgensen at the California School of Design. During this period, he painted Bay-Area scenery. In 1886 he began a four-year period of study and travel in Europe, enrolling in Paris at the Ecole des Beaux-Arts and the Academie Julian. His teachers were Jean-Leon Gerome and Fernand Cormon. In San Francisco, where he returned in 1890, he met and married Kathleen Mary Murphy, and the couple immediately departed for an extended trip to England and France. Peters painted the countryside and produced numerous landscape paintings, especially moonlit views of Brittany and Paris—his first nocturnes, encouraged by the aesthetic of Whistler, whose influence was pervasive in England and France. 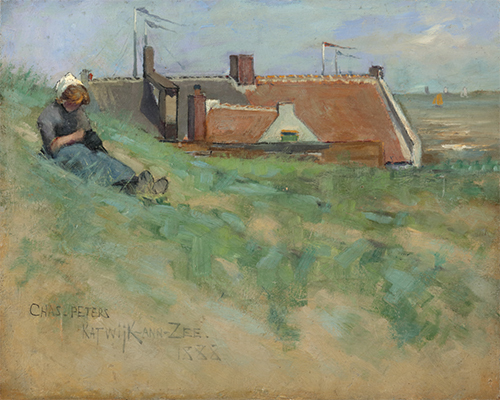 Upon his return to California about 1895, Peters held a large show in San Francisco and was able to sell many of his works. Soon after, he and his family relocated to Monterey, California where Peters became interested in California adobe ruins and missions as subjects for his paintings. Night paintings with rich blues highlighted by moon light became his signature work. Like most Tonalists, he painted in his studio. It was written of him that Monterey residents often saw him “wandering about in the semi-darkness, taking down notes here and there, studying the different phases of light, and creating a vivid mental picture of the scene he wished to paint.” (Lowrey 158). Peters returned to Monterey in 1900 and purchased thirty acres of land where he built an estate. He exhibited in the annual exhibitions of the San Francisco Art Association and the Bohemian Club. Along with William Keith, Xavier Martinez, Karl Neuhaus and Will Sparks, he established in Monterey the Del Monte Art Gallery, which was the first gallery focused exclusively on work by California-based artists. The later part of his life was stricken with sadness and grief with the death of his wife in 1902 and daughter in 1904. During this period, Peters began to compensate for his emotional losses by throwing lavish parties for his artist friends, sparing no expense. Following the 1906 earthquake in San Francisco, his estate became the hub of activity for Bay Area artists. In 1909, Peters met Mabel Prudhomme Easley, a sophisticated and worldly woman. She was an artist who painted delicate landscapes and had recently shown her work in the San Francisco Bay Area when she met Peters. They were soon married and spent a year in England where Peters had a very successful exhibition in London in 1910. When the couple returned home to California it became evident that Peters spending had caught up with him. Authorities foreclosed on his Monterey estate. Suffering depression, he began to drink regularly which resulted in the deterioration of his health. He and his wife separated in 1920 and Peters became ill soon after. However, when Mabel heard the news of his illness, she returned and remained with him until his death in San Francisco in 1928.